More than 1,200 publishers now have signed on to the ebook-bundling app Peter Hudson and Marius Muja founded in 2013 as BitLit Media. New this season: recommendations for readers. Vancouver-based Shelfie (formerly BitLit Media) has begun offering readers personalized book recommendations as part of its service. ‘Where Does ‘The Salmon of Doubt’ Stand on Your Shelf? When last we heard from Shelfie, co-founding CEO Peter Hudson was looking back at “three years of cold calls,” talking publishers into sign on to have their ebooks matchable to print books already owned by readers. Created as BitLit Media by Hudson and Marius Muja, the Vancouver startup now has looked south to Seattle for a little inspiration and added what it likens to “Amazon’s familiar ‘people who bought this book also bought'” recommendation algorithms. In case you need a refresher, here’s how Shelfie works, in a wholly hypothetical example. Let’s say you own a copy of Suzanne Collins’ Mockingjay in hard cover and you’d like it in an ebook format. You download the Shelfie app in Android or iOS and use it to take a picture of your bookshelf on which the Collins rests. When you submit that image of your bookshelf to the system, Hudson’s team then lets you know which books on your shelf it can offer you in ebook format, either free or for (usually) a discounted price — each publisher decides on the cost of an ebook, as well as on what DRM constraints it may have. If the Miller is one of the books that Shelfie then tells you it has available in a digital copy, you can get it. 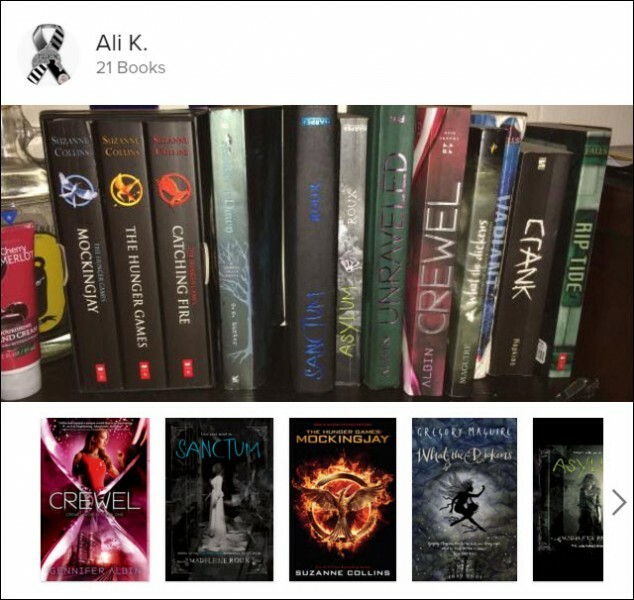 You can see in the image below a case in which a reader called Ali K. sent his or her Shelfie image to Vancouver and, yes, it turns out that an ebook edition of Mockingjay is available as are some other titles. A reader called “Ali K” sent this Shelfie shot of his or her bookshelf to the company to see what e-editions might be available. Below are some of the titles Shelfie has available as ebooks. Image courtesy Shelfie. The advantages here run both ways. The reader can get a digital copy of a beloved book. The publisher gets data. Its possible that the publisher may have had no data whatever from Ali K.’s original print purchase of Mockingjay, especially if that buy was made in a bricks-and-mortar bookshop. Once the ebook edition is obtained from Shelfie, however, the publisher does get data and basically finds that “lost buyer,” Ali K., as part of the process. Hudson and Vice-President for Content Mary Alice Elcock tell us that to create recommendations, Shelfie is analyzing the patterns of how readers shelve their books, revealed in those snapshots they’re submitting through the app. So something about how Ali K. is shelving her or his books is helping Shelfie sort out personalized recommendations for this reader. Shelfie offers a user his or her recommendations either in a unified list or categorized by genre. And the company says its library now is more than 250,000 titles deep.